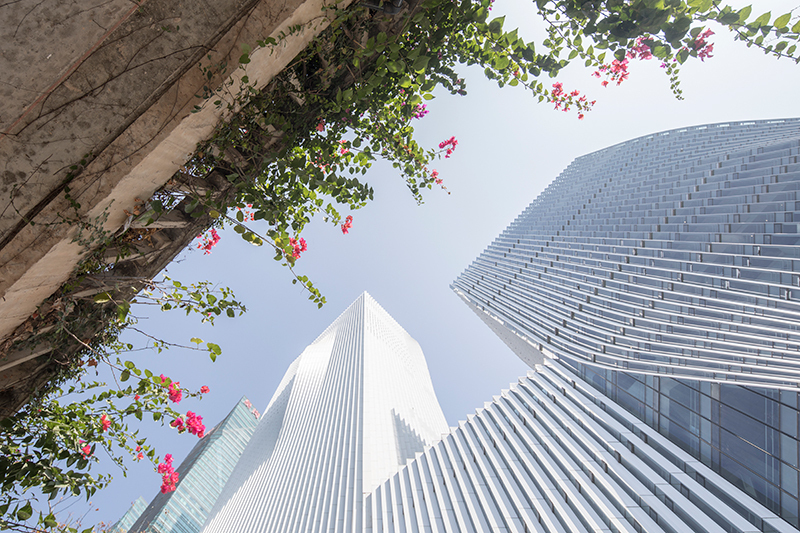 The new home for Shenzhen Energy Company looks different because it performs differently: the building skin is developed to maximize the sustainable performance and workplace comfort in the local subtropical climate of China’s tech and innovation hub in Shenzhen. 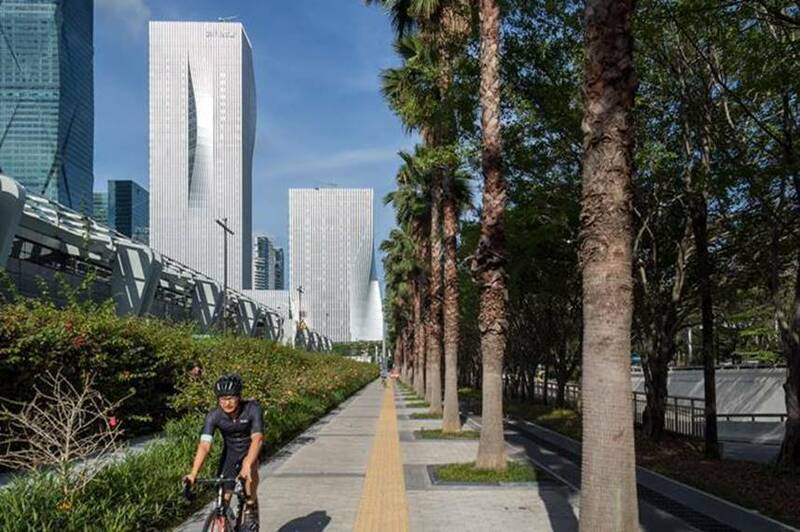 The 96,000m2 office development for the state-owned Shenzhen Energy Company is designed to look and feel at home in the cultural, political and business center of Shenzhen, while standing out as a new social and sustainable landmark at the main axis of the city. 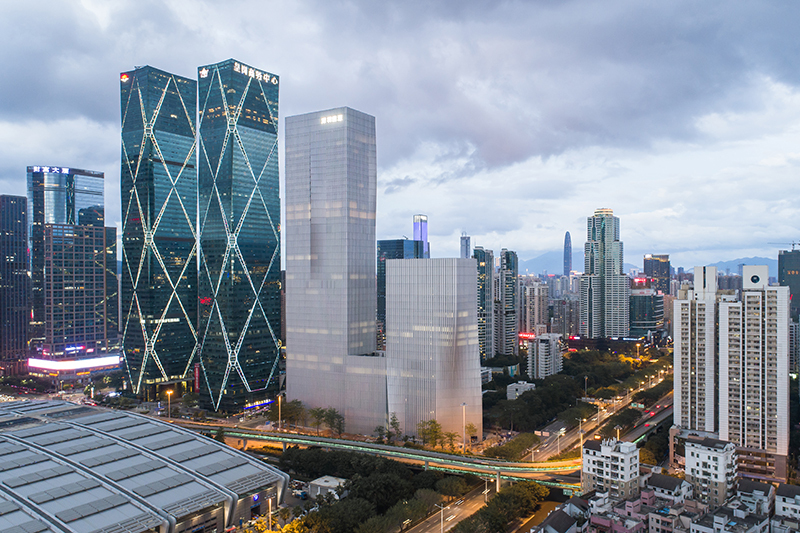 BIG won the international design competition in the city known as China’s ‘Silicon Valley’ with ARUP and Transsolar in 2009 and started construction in 2012. 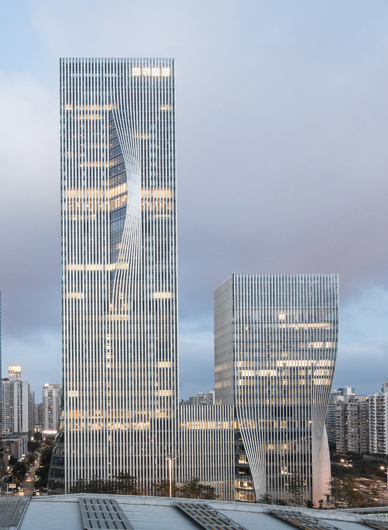 “Shenzhen Energy Mansion is our first realized example of ‘engineering without engines’ – the idea that we can engineer the dependence on machinery out of our buildings and let architecture fulfill the performance.Shenzhen Energy Mansion appears as a subtle mutation of the classic skyscraper and exploits the building’s interface with the external elements: sun, daylight, humidity and wind to create maximum comfort and quality inside. A natural evolution that looks different because it performs differently.” Bjarke Ingels, Founding Partner, BIG. 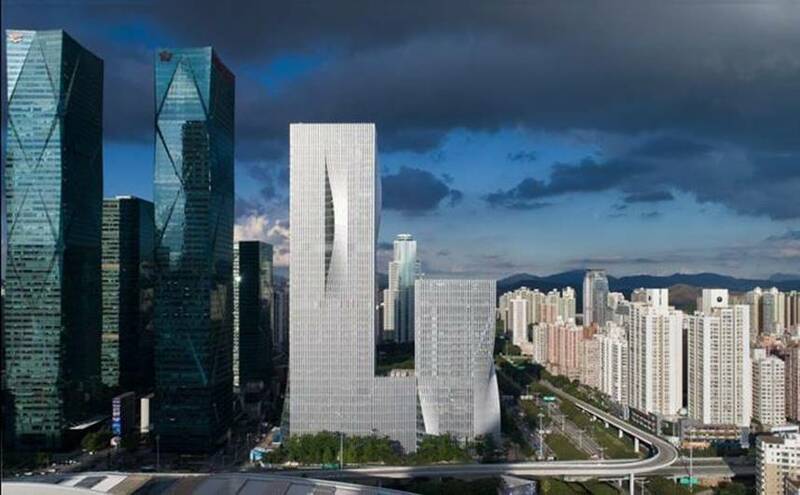 The volume and height of the new headquarters for Shenzhen Energy Company was predetermined by the urban masterplan for the central area. 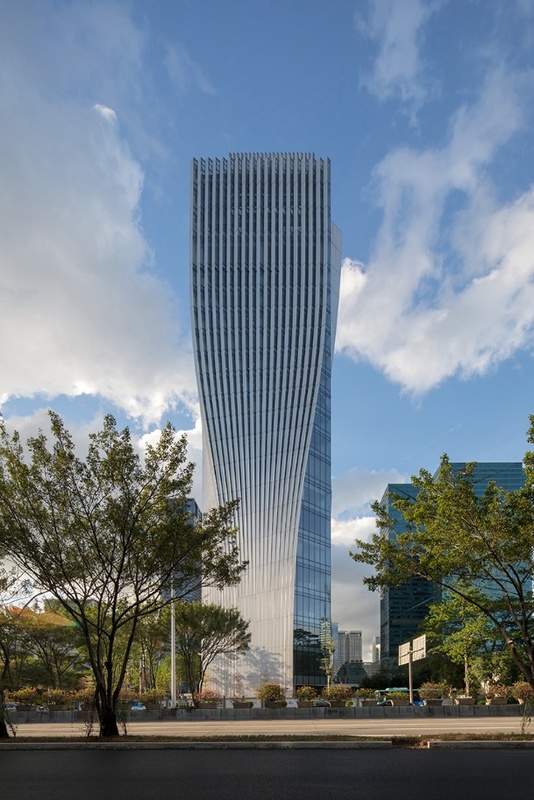 The development consists of two towers rising 220m to the north and 120m to the south, linked together at the feet by a 34m podium housing the main lobbies, a conference center, cafeteria and exhibition space. 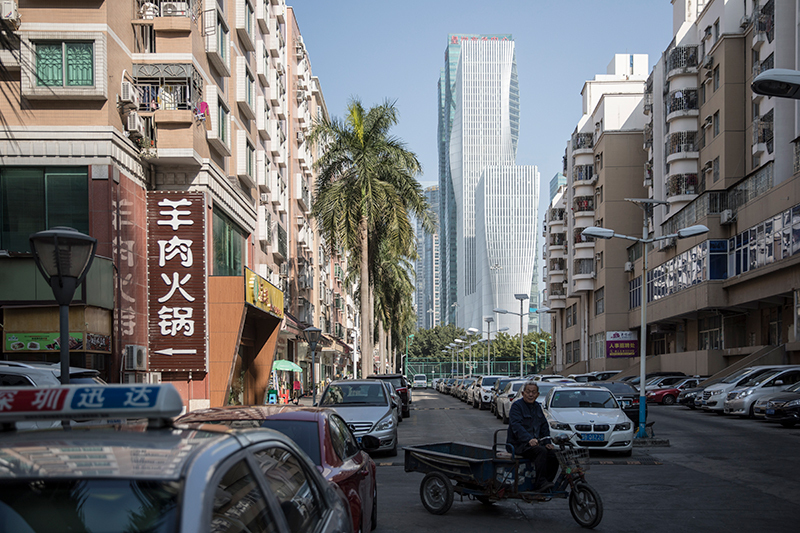 Together with the neighboring towers, the new towers form a continuous curved skyline marking the center of Shenzhen. 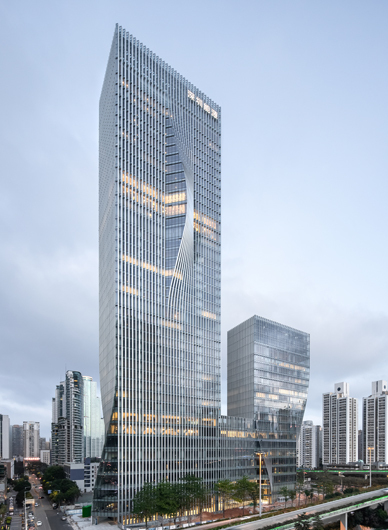 BIG developed an undulating building envelope which creates a rippled skin around both towers and breaks away from the traditional glass curtain wall. By folding parts of the envelope that would reduce solar loads and glare, a façade with closed and open parts oscillate between transparency to one side and opacity to the other. The closed parts provide high-insulation while blocking direct sunlight and providing views out. As a result, the towers appear as a classical shape with an organic pattern from a distance and as an elegant pleated structure from close-up. 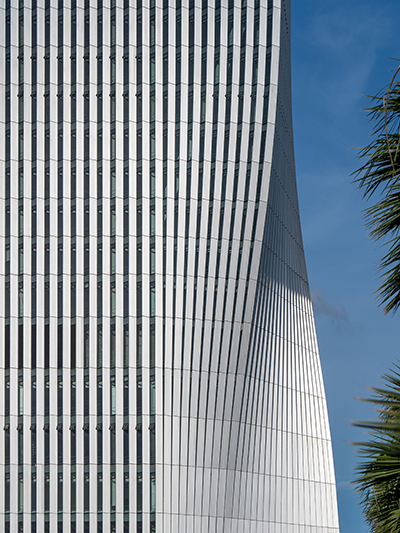 The sinuous direction of the façade corresponds to the solar orientation: it maximizes north-facing opening for natural light and views, while minimizing exposure on the sunny sides. This sustainable facade system reduces the overall energy consumption of the building without any moving parts or complicated technology. 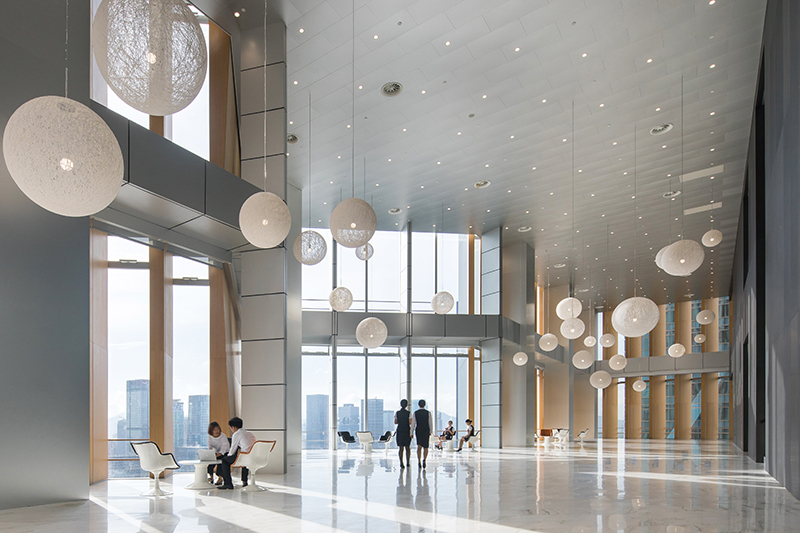 From the street level, a series of walls are pulled open for visitors to enter the commercial spaces from the north and south end of the buildings, while professionals enter from the front plaza into the daylight-filled lobby. Once inside, the linearity of the building façade continues horizontally: the pixel landscape of the stone planter boxes is in the same dimensions and arranged in the same pattern as the ripples of the building envelope. 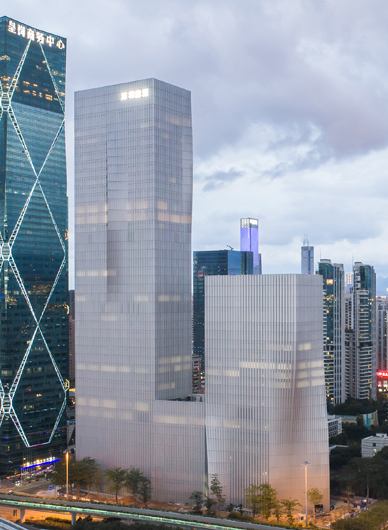 The offices for Shenzhen Energy Company are placed on the highest floors for employees to enjoy views to the city, while the remaining floors are rentable office space. 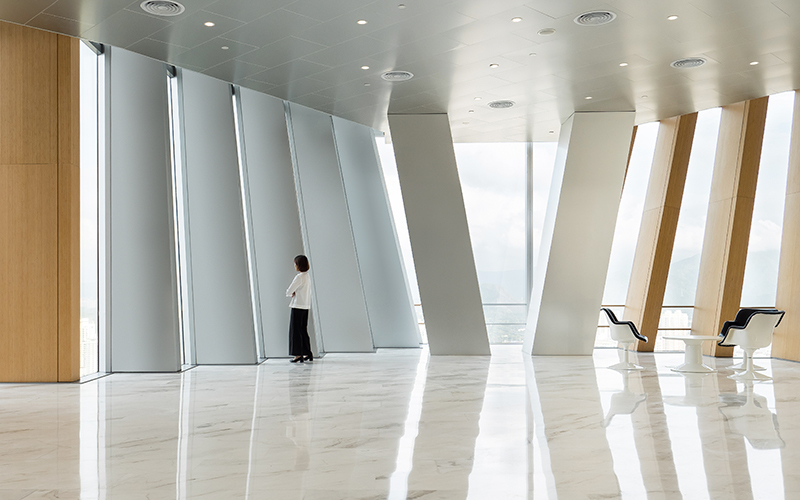 Within the protruded areas of the building, the façade is stretched out—two smooth deformations create large spaces for extra good views on each floor, meeting rooms, executive clubs and staff facilities. The folded wall provides a free view through clear glass in one direction and creates a condition with plenty of diffused daylight by reflecting the direct sun between the interior panels. Even when the sun comes directly from the east or west, the main part of the solar rays is reflected off of the glass due to the flat angle of the windows. As the sun sets, the changing transparency and the curved lines of the façade create an almost wood-like texture or a scene of vertical terraced hills. 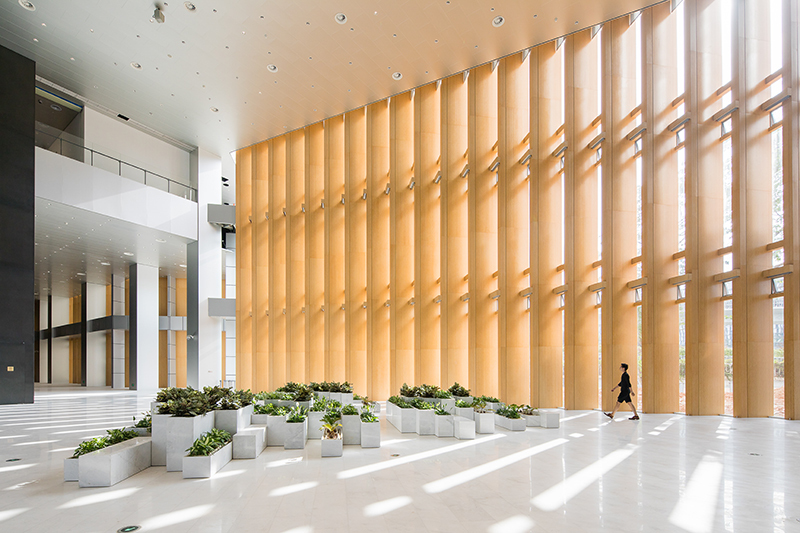 The slits that open between the curtain wall to reveal special spaces such as boardrooms, executive offices and breakout areas, lend the building a distinct character from different parts of the city. 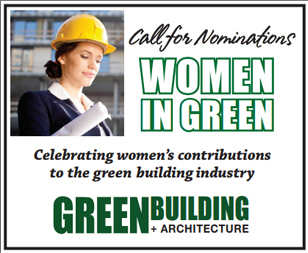 Copyright Green Building and Sustainable Strategies Magazine. All Rights Reserved.